The ancient Egyptian (Kemet) idea of Maat encompasses many concepts - central among them was the idea of order, balance and harmony. Every institution expresses a consciousness which is manifested in its ethos, or guiding beliefs and ideas. Driven by our mission, which calls us to give birth to the genius in every child, we have developed an educational philosophy that demands the very best from our students as reflected in our values. To sustain an educational institute in the best traditions of our ancestors. We will give birth to the genius resident in every child, assist parents in their efforts to become models of right behavior and right order for their children, and provide a working environment that allows our educators to follow their passion of teaching and loving our children. We believe that all children have a right to a quality education. Within every child resides genius, and it is our responsibility to guide and instruct our children on their path to their greatness. 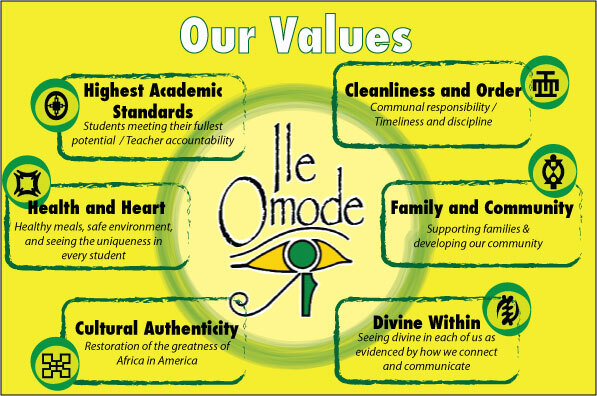 The Wo'se Community Church school program, as embodied in Ile Omode, is grounded in academic and cultural principles which provide a foundation for the development of self-determined scholarship and leadership. Our goal is to create a learning environment which encourages creative problem solving, teamwork, and confidence. Through learning experiences that are both challenging and fun, we are preparing our children to compete in a technologically advanced society. We emphasize African values and community as a framework for the utilization of this technology. Our vision is that our students become highly motivated and creative leaders who are both capable and committed to the betterment of our nation. We stress the development of our students' bodies, minds, souls, and consciousness. We develop our bodies by eating a proper diet and exercising daily. We develop our minds by acquiring knowledge and skills that are useful to our advancement. We develop our souls by developing our relationship with the Creator and with our people based on Maat (truth, justice, right-order, and reciprocity). We develop our consciousness by attaining self-awareness, identity, self-control, and discipline. Our children, today's children, represent our tomorrow. What they are gives us an indication of our future as a people. Ile Omode joins parents in the task of nurturing the development of superior children. I must control my thoughts. I must control my actions. I must have and show devotion to purpose. I must have faith in the ability of the Teacher to teach me the Truth. I must have faith in my ability to assimilate the Truth. I must have faith in my ability to wield the Truth. I must be free from resentment under the experience of persecution. I must be free from resentment under the experience of wrong-doing. I must cultivate the ability to distinguish right from wrong (that which is loved from that which is hated). I must cultivate the ability to distinguish the real from the unreal (have a sacred-centered set of values). I have not harmed anyone. I have not caused another to be harmed. I have not ignored a younger person. I have not taken food from a younger person. I have not been talkative. I have not spoke badly against anyone. I have not called undue attention to myself. I have not done harm to animals. I have not done harm to the land. I have not polluted clean water. I have not ignored words of right and truth. I have not ignored the Divine spirit in me. Umoja: (Unity - We shall strive to maintain Unity in the family, community, nation and race. Kujichagulia (Self-Determination) - We shall define, name, create and speak for ourselves. Ujima: (Collective Work and Responsibility) - We shall build and maintain our communities together, our brothers' and sisters' problems shall be ours to solve together. Ujamaa: (Cooperative Economics) - Together we shall build and maintain our own businesses and together profit from them. Nia: (Purpose) - We shall make our collective vocation the building and developing of our community and the restoration of our people to our traditional greatness. Kuumba: (Creativity) - We shall do as much as we can, in any way we can, to leave our community more beautiful and beneficial than when we inherited it. Imani: (Faith) - We will believe with all our hearts in our God, our people and in the righteousness and victory of our struggles.